Today I’ve put together a fabulous video featuring my recent vintage finds from op shops (thrift stores) and vintage markets. I made this video after visiting Cherrybomb Beauty Parlour where my hair was dyed by Vicki, styled by their apprentice Chloe, and had my nails done by Gosia. I’m featuring items I sourced from The Polka Dot Vintage Markets which is on every few months, and from op shops such as Anglicare Morning, Salvo Morley, and Good Sammy’s on Beaufort Street. If you have any comments, question, feedback, or suggestions I would love to hear them. 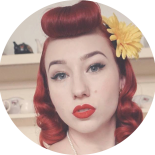 Thank you so much for supporting my little channel, if you’d like to stay up to date with all my vintage fun be sure to subscribe! More vintage fun coming next week. You are the vintage queen. This entry was posted on April 28, 2017 by Miss Lady Lace in Pinup Life, Vintage Fashion, YouTube and tagged 1940's, 1950's, blogger, glamour, miss lady lace, miss lady laces pinup blog, perth burlesque, perth pinup, perth pinup blog, perth pinup community, pin up, pinup, pinup blog, pinup blogger, pinup fashion, pinup girl, pinup life, pinup lifestyle, pinup perth, red lips, retro blog, retro girl, retro glamour, the perth pinup community, victory rolls, vintage, vintage blog, vintage blogger, vintage fashion, vintage girl, vintage glamour, vintage perth, vintage pinup blog.